Worship leaders and music teachers are both different and important roles to developing a worship team. On a regular basis, many roles of a teacher are expected from worship leaders. My goal is to give you a few ideas of simple warm-ups and exercises you can incorporate into your rehearsals that will help teach your team to play by ear. Some of these will seem “childish,” but the reality is that most childish things are structured to easily learn and understand. You’ll most likely have resistance from team members who don’t consider growing as a part of serving. If you get resistance from team members, simply say something like, “We’re going to try something for a few weeks, and if it doesn’t work help we’ll stop”, or “You’ll probably feel like a child, but I found a blog post that recommended this, so just play along to see if there’s any truth to what he said”. Yes, everybody gets to sing, including the drummer! Think about how children learn to speak and develop their own voice. First they hear and recognize language, then they copy syllables, words and phrases, all before they start speaking. Same thing here, the structure of music needs to be internalized. Find somebody on your team who can play a major scale, or find a YouTube tutorial on your instrument, and then sing 1, 2, 3, 4, 5, 6, 7, 8, up with the scale and backwards on the way down down. If that’s coming along, then add a 1, 3, 5, 8, 5, 3, 1 after the scale. Instrumentalists don’t need great voices for this to work; getting them to sing at all will be a challenge enough. Once this exercise becomes more natural, point out that the key your song is in is “1” and the rest of the chords are numbered after that. Once they make the connection, they’ll be super excited because a song isn’t just a collection of random notes anymore! This one can be tricky to slip in. If you dedicate time to it specifically, it starts to feel really cheesy, really quickly. It should be just another musical request for the band along with “build during the chorus” or “no drums on the bridge”. First, you need to make sure you’re leading musically. If you want a section quieter, then you play quieter. If you want it long and smooth, then play long and smooth. If you want it short and choppy, then play short and choppy. Once you’re doing that (and you may already be doing that) then anticipate the change by 4-8 beats. When you want the band to play softer on the second verse, start playing softer at the end of the chorus in front of it. Do this enough times, on enough songs, for enough weeks, and it’ll be second nature for your musicians to listen and follow your lead. Your team will play smoother, and your rehearsals will run smoother because you don’t have to explain every musical nuance. What do eyes have to do with music? Everything. Have you ever had a conversation with someone, but never once looked at them? It lacks synergy. I’m not saying the message can’t get across, but you sure won’t lock-in as a team if nobody can take their eyes off the music. Disclaimer: this is not a discussion on music stands versus mandatory memorization, but it is fact that if you know your music well enough to comfortably look away from the page for a few moments, you’ll play it better. Like I said before, preface this with a disclaimer like, “We’re going to try something, and it doesn’t need to sound very good, but I read that it can help us play tighter (more together)”. This gives everyone permission to feel uncomfortable and sound bad. Then try playing a chorus with everyone’s eyes off the music. Have them look around the team, move together, play together, watch fingers or sticks, etc. Try looping the chorus until it feels comfortable. Then try 2 sections, and eventually even attempt an entire (easy) song. It’s awkward at first, but you’ll be impressed how well you’re playing together. I know the title says 3 ways, so consider this your bonus for making it to the end. After you’ve worked your way to #3 and you’re playing without staring at the page, start mixing in elements from #1 and #2. You might even consider throwing in hand signals to tell musicians to start to build (palm up, slowly lifting your hand) or to go to the chorus (make a C shape with your hand). You could even explain #1 in the context of a song, but ONLY if you’re confident how this works before trying to teach it. If you’re playing “How Great Is Our God” in C, explain that C is 1, F is 4, G is 5, and Am is 6. Then during interludes, show them a number with your hand and everybody moves to that on the next phrase. They’ll be listening better and developing the chops to play by ear. Be careful to attempt too much in one week, or your team will feel more like your guinea pigs than your team of volunteers. Little pieces week after week will be very effective though, and a culture will start to form where team members enjoy practicing, and love the feeling of excellence. This article was provided by guest contributor Matt Tims, owner of Coming Hour: Worship & Music. 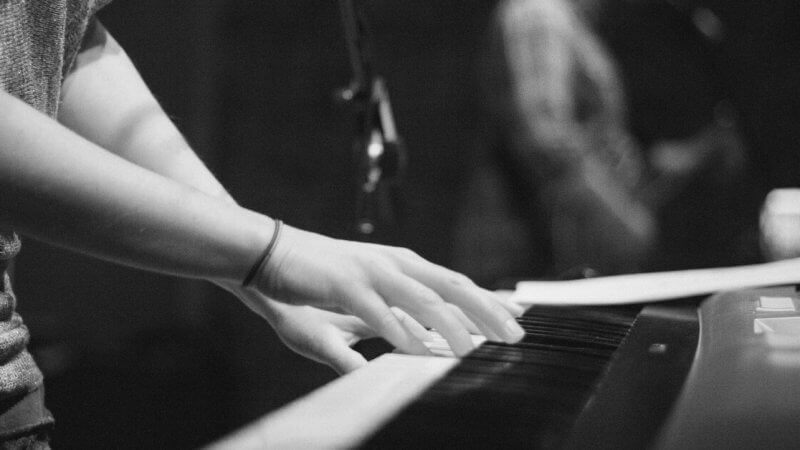 Matt empowers worship leaders and musicians by providing personalized training and equipment. He loves chatting about worship and gear to discover what will work best for you. Matt Tims is the owner of Coming Hour: Worship & Music. He empowers worship leaders and musicians by providing personalized training and equipment. He loves chatting about worship and gear to discover what will work best for you.